Not that long ago, I discovered the reason why my house was slowly turning into a sauna. Summer or winter, it didn’t make a difference – my house was hot all the time, thanks to my poorly ventilated attic. If you’re in the market for a home, you’ll soon discover why venting your attic is important. Now that I know the ins and outs of attics, I wanted to share more about what I’ve learned about venting your attic if you don’t have eaves. I live in a small, square house. It’s a classic post-war ranch house, built in the ‘50s to meet the needs of the soldiers returning from WW2 and the needs of their growing families. The houses were built with speed and efficiency in mind. We bought our house from the original owners who never made any updates aside from putting wood paneling OVER the drywall in every room and installing light switches that don’t attach to anything. So aside from the nostalgia factor our home provides, it has none of the modern-day architectural advancements that could make our lives a lot easier. Most post-war ranches are one-story houses with a low roof pitch and shallow eaves with a flat soffit. Did I just lose you? I thought so. Let me break it down. A roof pitch is how steep the slope of the roof is. For example, the Addams Family house has a high roof pitch. The eaves are the part of the roof that hangs over the walls of the house. A great example of great wide eaves are the homes of Frank Lloyd Wright. He loved big eaves. Soffits are the underside of the eaves. So if you have shallow eaves with a flat soffit, you have a very small overhang that has a flat bottom. Now that we have that out of the way, let’s get to the heart of the matter – venting a house with little to no eaves or soffits. 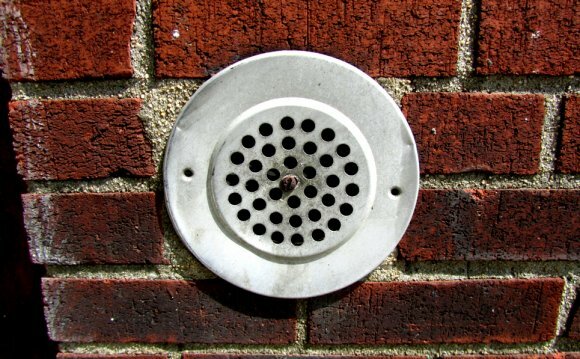 The most common way to add ventilation to an attic is by installing air intakes in the soffits and putting an outlet at the gable of the house. This creates a natural air flow by drawing in the air from outside, pushing it up and out through the vent at the top of the house. This is called passive ventilation. Passive ventilation relies on the differences of air pressure from the outside and the inside of your attic. Cooler air is heavier and denser; it’s pulled into the attic from the soffit, where it warms up and becomes lighter and less dense, and then escapes through the vent in the gable. This pressure creates a vacuum, drawing in the cold air to replace the hot air that has been lost through the gable. But if you don’t have eaves or if you have shallow soffits like me, ventilation can be a challenge.